By admin | April 25, 2015. Visit the Dublin Food Co-operative in Newmarket, Dublin 8 on any given Thursday, Friday, Saturday or Sunday and what you will find is something special. A bustling oasis in an area dominated by multinational supermarket chains, the co-op movement attracts members from, but not limited to, the Dublin 8 area. The co-op has called Newmarket home since 2007 and in 2013 extended its stay by signing a new five-year lease. Its commitment to the area has consolidated a loyal following comprised not only of locals but also of non-nationals. If supermarkets like Tesco and Lidl are the Goliaths of Dublin’s grocery scene, the co-op is very much the David, standing, chest out with a stone in its ‘quality over quantity’ slingshot while the giant slashes prices with its for-profit spear. Like a farmer’s market, the co-op specialises in the sale of organic foods sourced from local suppliers. Where it differs from a farmer’s market is the lack of meat and meat products and the unique nature of its operating model. As of 2009 it was the only Irish whole food retailer which operated as a consumers’ co-operative. Community is at the very heart of what the co-op does. The website carries the co-op’s message on its homepage: “What makes us different is that we’re 100% owned and controlled by our members, who not only save money at the tills, but also democratically decide how the co-op operates.” Because of its membership system, the co-op does not limit itself to grocery shopping. The co-op holds foreign language classes, cookery lessons and organises nature walks and has even hosted dance lessons for children of members. 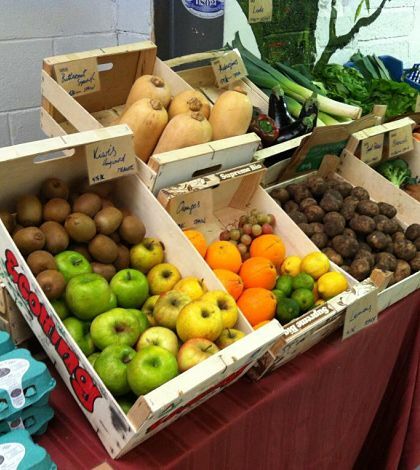 In a food retail environment saturated with controversy surrounding fair trade , health standards and price cuts, the Dublin Food Co-operative is an organic safe haven for the people of the Liberties and beyond.